AUCTION LOCATION: 11625 Anabel Ave. Garden Grove, CA. 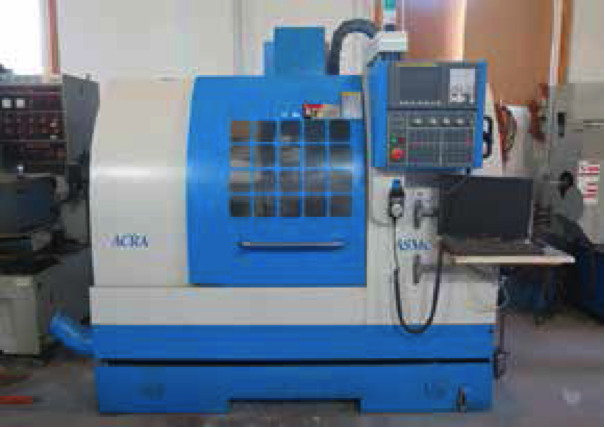 2006 Acra ASMC-610P CNC Vertical Machining Center s/n V6E95052 w/ Fanuc Series 0i MATE-MC Controls, 16-Station ATC, BT-40 Taper Spindle, Hand Wheel, Chip Auger, 16” x 29 ¾” Table, Coolant. 1999 Acra FVMC-810 CNC Vertical Machining Center s/n V3024 w/ Mitsubishi Controls, 16-Station ATC,BT-40 Taper Spindle, Hand Wheel, 17 ¾” x 39 ½” Table, Coolant. Mori Seiki MV-80 CNC Vertical Machining Center w/ Fanuc System 6M Controls, 32-Station ATC, BT-50 Taper Spindle, Chip Conveyor, 31 ½” x 74 ¾” Table, Coolant. Mori Seiki MV-50 4-Axis CNC Vertical Machining Center w/ Fanuc System 6M Controls, 24-Station ATC, BT-50 Taper Spindle, Chip Conveyor, 21 ¾” x 55” Table, Coolant. 2007 Acra FEL-1640 ENC 16” x 40” CNC Gap Bed Lathe s/n 16407031577B w/ Fanuc Series 0i MATETB Controls, 7.5Hp Motor, 8-Station Turret, Hydraulic Tailstock, 7” 3-Jaw Power Chuck, Coolant. Lagun FTV-4 Vertical Power Mill s/n 8909 w/ Sargon DRO, Mitutoyo Digital “Z” Scale, 4Hp Motor, Dial Change RPM, Chrome Ways, Power Feeds, 7” Riser, R8 Spindle with 40-Taper Attachment, 11” x 54”Table. Saimp mdl. KSS180 14” x 42” Geared Head Gap Bed Lathe s/n 1598 w/ 45-1500 RPM, Inch/mm Threading, Taper Attachment, Tailstock, KDK Tool Post, 5C Speed Chuck, 12” 4-Jaw Chuck. 1995 EZ Spark mdl. ES1208C Die Sinker EDM Machine s/n 9030556 w/ EZ Spark P50 Power Source and Controls, Sony 3-Axis DRO, 12” x 23 ¾” Table, 8” x 18” Magnetic Chuck, 7” x 7” Die Base, Coolant Filtration System. 2012 Atlas Copco GX11FF EL Rotary Air Compressor with Integrated Air Dryer s/n CAI606888 w/ Air Tank, 8962 Metered Hours. Reid 6” x 18” Automatic Surface Grinder w/ Magnetic Chuck. W.F. Wells 7” Horizontal Band Saw. Clausing Variable Speed Pedestal Drill Press w/ 330-4000 RPM. Mitsubishi FGC15K LPG Forklift s/n AT81D00537 w/3-Stage Mast, 188” Lift Height, Side Shift, 4 th Accessory Lever, Cushion Tires, 7680 Metered Hours. 3 Ton Portable A-Frame Gantry w/ Coffing 3 Ton Electric Hoist. Big Joe mdl. 1066 Electric Die Lift s/n 318.